[Episcopal News Service – Boulder, Colorado] Has God placed a dream on your heart? For the Rev. Peter Munson, the answer is “yes.” In February, Munson, 61, will resign as rector of St. Ambrose Episcopal Church here in South Boulder – a church he’s served for more than 17 years – to walk 3,600 miles from Charleston, South Carolina, to San Francisco. “I believe, if you’re a person of faith, we’re all called,” said Munson, during an interview with Episcopal News Service in a downtown Boulder coffee shop, where he shared his 11-year dream. Along the way, Munson hopes to speak to faith and secular organizations about his dream and his journey and to find hospitality – lodging and meals – while raising money through his nonprofit 6 Million Steps for Kids to benefit four charitable organizations serving youth and young adults: REMAR Children’s Home and School in El Salvador; Street Fraternity, a mentoring program for 14- to 25-year-old males from refugee families living in Denver; Episcopal Relief & Development; and The Episcopal Church in Colorado’s various children’s programs. On Nov. 20, 2008, Munson was hiking alone in Rocky Mountain National Park – a park he’s hiked in for years and where as a student at the University of Colorado he worked as a guide – and as he descended from Sky Pond in Glacier Gorge, the idea came to him to walk across the country, writing and speaking about his experience and to raise money for disadvantaged children and young adults. “‘The place God calls you to is the place where your deep passion and the world’s deep hunger meet,’” said Munson, paraphrasing Presbyterian theologian and writer Frederick Buechner. If you or your parish would like to invite the Rev. Peter Munson to speak at your church or offer him hospitality, email peter@brightfutureforchildren.com. His estimated eight-and-a-half-month, 3,600-mile journey begins in Charleston, where he grew up, and will cross South Carolina, Georgia, Tennessee, Kentucky, Missouri, Kansas, Colorado, Utah, Nevada and, eventually, California. At least in the Midwest, he expects to average 20 miles a day, six days a week. As he gets out West, the mileage will likely decrease, especially in western Utah and Nevada, where he’ll have a support vehicle following him through the high desert. Four months later, Munson presented his idea to his parish’s leadership. 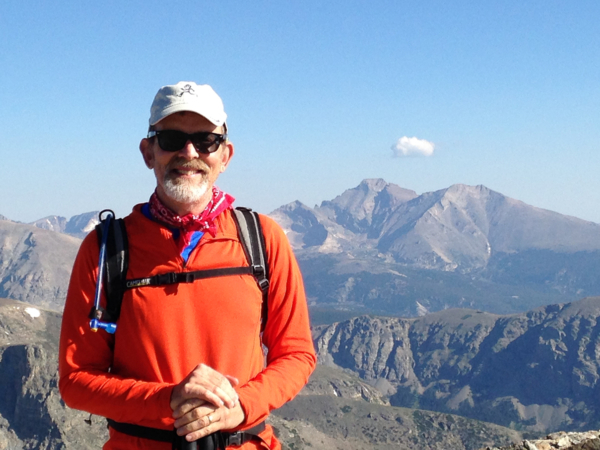 Although Munson has hiked and climbed most of Colorado’s 14ers – peaks exceeding 14,000 feet, of which there are more than 50 – he’d never hiked and backpacked, as one woman pointed out. She suggested he first backpack the Colorado Trail from Denver to Durango, a distance of 500 miles, and he did so, hiking it over three summers beginning in 2011. The first year, he hiked 250 miles. In 2012, it was 50 miles because of a bad wildfire season, and in 2013, he hiked the remaining 200 miles in 16 days. While walking the Colorado Trail, he read “Wild,” Cheryl Strayed’s memoir of hiking 1,000 miles of the 2,653-mile Pacific Crest Trail alone, without any training or preparation. When Munson, then in his 50s, started his hike, his backpack weighed between 45 and 50 pounds. His third day on the trail, he met a 22-year-old male who’d hiked the 2,190-mile Appalachian Trail from Maine to Georgia. The young man offered to go through Munson’s pack with him, discarding nonessential items like bear spray and a bear canister (not necessary in high altitudes) for storing food. By the third year, when Munson finished his hike, his pack weighed 28 pounds. All the while, Munson’s dream of walking across the country kept returning to him, and he kept talking about it with his parish and then at a clergy conference, which led to pulpit exchanges with Episcopal priests on Colorado’s Front Range. Munson walked from his home in Arvada, a Denver suburb, to his church in Boulder, to Longmont and Frederick, all along state highways to the pulpit exchanges. Eventually, he and his parish decided together that, rather than make the journey as St. Ambrose’s rector, Munson would resign and make the journey on his own. “There’s a lot to be said about waiting until 65 … it’s just not what I’m hearing,” he said, with his dream and aging in mind.